It may be time to turn the page on the e-book reader. Pacific Crest analyst Chad Bartley is slashing his forecast on the Kindle. 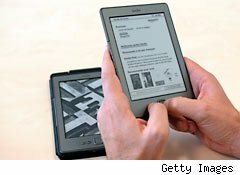 He now sees Amazon.com (AMZN) selling just 24 million units of the Kindle family of non-tablet e-readers in 2012. His earlier target was calling for 28.6 million to be sold. It's important to note that the figure doesn't include the $199 Kindle Fire. Bartley actually raised his target -- from 12.7 million to 14.9 million -- on the number of entry-level Amazon tablets that the leading online retailer will sell this year. However, it's easy to believe that the success of Amazon's tablet is coming at the expense of its market-leading e-book reader. Amazon has certainly been aggressive enough in pricing its Kindle e-readers for mainstream appeal. The Kindle hit the market at $399 five years ago; these days, you can pick one up for as little as $79. The problem is that the $199 Kindle Fire and Barnes & Noble's (BKS) $249 Nook Tablet can do everything that each company's cheaper dedicated e-readers can do -- plus a lot more as Android-fueled tablets. Purists will cringe. It took them some time to adjust to the idea of replacing leafy books with e-readers, and now the market wants them to trade the comfort of E Ink for glaring tablet screens? But they -- and the tech industry -- may not have much of a choice. Apple (AAPL) is making a huge push to get into the classroom through the digital textbook initiative it announced last month. Richly detailed colorful textbooks spring to life with interactive features on the iPad. Traditional e-readers outside of Barnes & Noble's Nook Color just don't have the palette to pull that off. There's still time. Even Bartley sees Amazon selling 9 million more Kindles than Kindle Fires this year. Traditional books continue to be published in black and white, and that's just fine for Amazon, Barnes & Noble, and Sony e-Ink gadgets that are easy on the eyes. The trend is still working against dedicated e-readers. As more classrooms begin embracing digital textbooks on tablets, that will be the platform that young people associate with digital book consumption. The fact that they can also use tablets to play games, check the weather, and stream videos will make them the new Swiss Army knives of students. If you recently bought a new Kindle or Nook, don't panic. They're now cheap enough where you can make it worth your initial investment after just a handful of books. However, don't be surprised when bibliophiles who originally lamented the gradual demise of the crisp paperback and now fear that their e-readers will be obsolete begin firing up their tablets. Longtime Motley Fool contributor Rick Munarriz does not own shares in any of the stocks in this article. The Motley Fool owns shares of Amazon.com and Apple. Motley Fool newsletter services have recommended buying shares of Apple and Amazon.com. Motley Fool newsletter services have recommended creating a bull call spread position in Apple.